The intersection of technology and liberal arts has taken on a new approach at Apple's retail stores, where some locations are now doubling as public galleries to showcase art created with Apple hardware and software. The art displays are part of Apple's new "Start Something New" campaign, which began online last week, showcasing the kind of "amazing things" that can be made with the company's products. 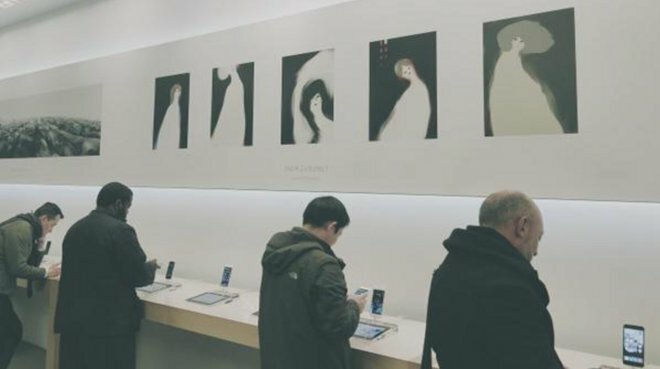 But in addition to online art galleries, Apple has also begun to bring them to retail stores, spotlighting the creations of talented Apple users. The retail component of the art galleries, detailed by ifoAppleStore, is a first for Apple, as the company has never before had such a campaign span both its website and retail stores. Rather than focusing on the products themselves, Apple's new ad campaign focuses on what its hardware and software, as well as third-party apps, allow users to do. "Every piece in this gallery was created on an Apple product," the company has said. "Every brushstroke, every pixel, and every frame of film was brought to life by talented Apple users from around the world. As you explore their work, we hope it inspires you to create something new." Late Apple co-founder Steve Jobs famously inspired his company to try to find the intersection of technology and liberal arts when creating products. In a presentation in 2011, months before his death, Jobs explained his philosophy and how products like the iPhone and iPad were making great strides in that direction. "It's in Apple's DNA that technology alone is not enough," Jobs said. "That it's technology married with liberal arts, married with the humanities, that yields us the result that makes our heart sing. And nowhere is that more true than in these post-PC devices."